Thank you for choosing Borg & Ide for your imaging needs. We’ll do our best to make your experience convenient, comfortable and pleasant. Get exam preparation instructions so you’re ready for your appointment. Important information about Insurance and Billing procedures. We take patient safety seriously, and strive to use only the radiation necessary. No time to call for an appointment? Just complete our Online Scheduling Form and we’ll call you within one business day. 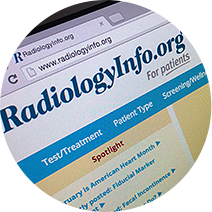 Get test and treatment information and learn more about patient safety at radiologyinfo.org.